The zodiac sign of a person born on this day is Pisces ♓ (The Fish) – a mutable sign with Water as element. February 23 is the 54th day of 2019 and there are 311 days remaining until the end of the year. Saturday is the day of the week. This is the 8th Saturday this year. Famous Feb 23 birthday celebrants include Theophilus London, Tom Bodett, Skylar Grey, David Sylvian, Emily Blunt, Steve Holy, Cyril Delevanti, Adam Hann-Byrd. 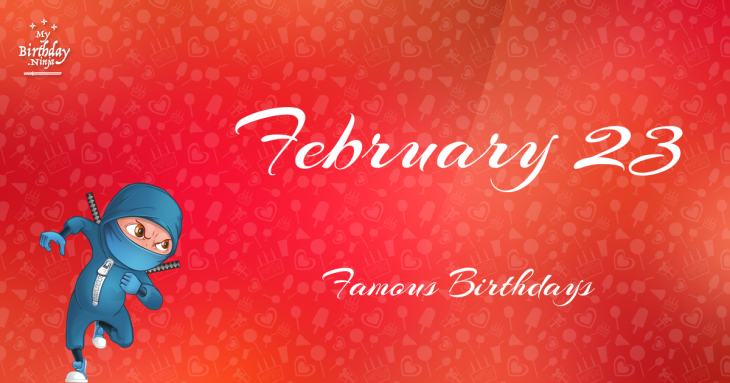 The following famous people celebrate their birthday on February 23rd. The list is arranged in chronological order and includes celebrities like actors, actresses, models, singers, rappers and producers. Click the after the name to explore the birth date info and know the meaning of their life path number. The epic list contains 186 persons. Showing 1 - 30.